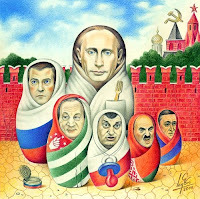 This piece of artwork is about "putryoshkas" (Putin + Matryoshka) -- the political figurines who regard Putin as father figure, inspirer, great leader, etc. The first and foremost putryoshka is of course Dmitry Medvedev, de jure president of the Russian Federation (everybody knows who de facto is). Among other "babies" are Sergey Bagapsh of Abkhazia, Eduard Kokoity of "South Ossetia", Alexander Lukashenko of Belarus and finally Serzh Sargsyan of Armenia, who comes along the bunch rather unwillingly, being forced to "adoption" by the Great Father. Armenia slowly begins to realize what kind of an "ally" Putin's regime is, and probably that's why Mr. Sargsyan has such an unhappy look on the picture. As for the fork in the pocket, probably you have already seen this symbol in many other satirical depictions. It's the golden fork appropriated by a Russian soldier during the "peace enforcing" campaign. Among the other "liberated" goods there were shoes, toilet basins and U.S. Hammers. All used.